For users who wish to use the MP-285 or MP-225 manipulator in conjunction with an inverted microscope, Sutter Instrument has designed a series of Microscope Dependent (MD) stands. 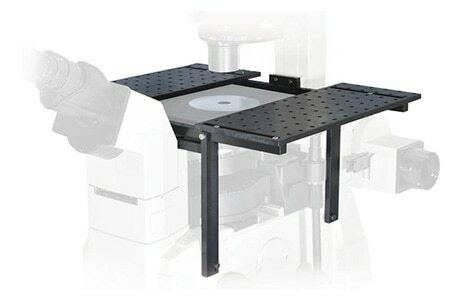 The typical MD stand is a manipulator platform that bolts directly to the frame of an inverted microscope. Stands are available in either single-sided or double-sided versions for the most common inverted microscopes made by Nikon, Olympus, Leica, and Zeiss. These platforms lend themselves to the absolutely drift-free recording configuration required when using the manipulators to position patch-electrodes to record from attached cells in culture. To mount the MP-285 to an MD stand you also need either the 285210 mounting adapter plate (for orthogonal mounting) or the 285RBI rotating base that allows for non-orthogonal mounting and rotation of the entire manipulator (note: the 285210 mounting plate is included with each MP-285 and MP-225).